A glass vase by Timo Sarpaneva, (Finnish 1926-2006) for Venini. 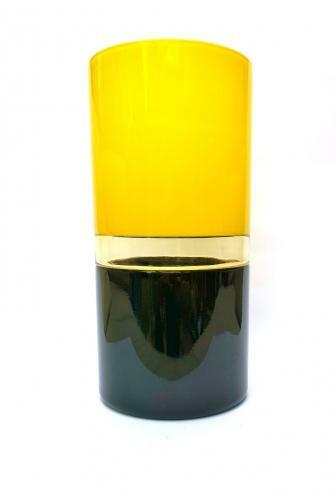 A Tuuli glass vase of circular form with fused glass bands coloured in yellow, black and clear glass using the 'incalmo' technique, engraved Venini 90 Sarpaneva, 31.5cm high. One of three in different colours, this vase is produced using the 'incalmo' technique which is particularly difficult and is realised by joining three different coloured pieces of glass when they are still hot.